President Michael McRobbie gave the annual State of the University speech Wednesday. 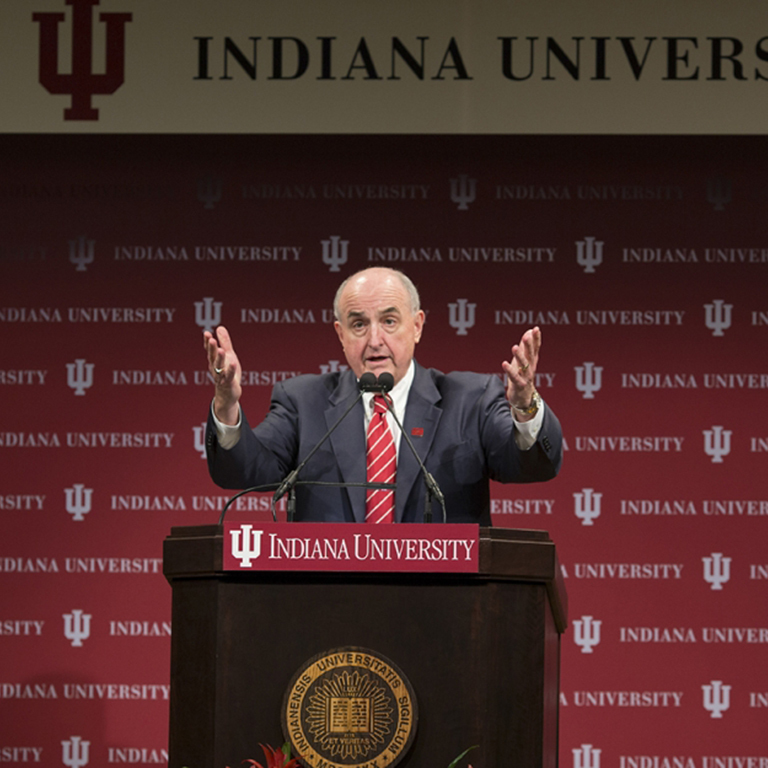 McRobbie discussed the past year and future goals for IU. He also talked about the freshmen in IU’s bicentennial class of 2020. IU will be celebrating its 200th anniversary in 2020. The University was founded four years after the founding of the state of Indiana, the bicentennial of which is this year. McRobbie shared the story of IU’s 10th President William Lowe Bryan, who was president during IU’s 100th anniversary. During the last 100 years, the University has become fully realized as Bryan wanted, McRobbie said. To be specific, in the last five years, eight new schools have either been renovated or have begun at IU. Many new programs, including new programs for engineering and architecture, have been created. Funding has also drastically changed since Bryan’s time. $614 million was granted to IU researchers to support their experiments and other activities last year, which is a 20-percent increase from the previous year. Another project McRobbie discussed was the For All: Bicentennial Campaign for Indiana University, a campaign started last year for raising funds to use toward celebrating IU’s bicentennial. In the past year, $1.5 billion has already been raised toward the goal of raising $2.5 billion by the end of 2019. Additionally, a new record of $500 million was raised last year from private and institutional philanthropy. “It is private philanthropy — expressed by nearly two centuries of advocacy, giving and service by IU alumni and friends — that has consistently provided the margin of excellence for Indiana University in so many areas,” McRobbie said. Other than graduating during the bicentennial year, McRobbie said IU’s 200th class has plenty of other qualities about them that set the class off from previous years. “This year’s freshman class is the largest, most diverse and most academically talented in campus history,” McRobbie said. McRobbie also announced the IU Media Digitization and Preservation Initiative will digitize 140,000 recordings by the end of this week. The initiative, announced by McRobbie last year, is a way to preserve IU history through digitizing outdated audio. “For many of these items, the playback equipment and repair parts can no longer be found except by scouring eBay,” McRobbie said. As part of the bicentennial plan and in remembrance of the former IU president, the University will be creating the Bryan Public Art Restoration Fund. “These funds will facilitate the needed maintenance and restoration of public art on all of our campuses, and will allow public art to retain its inspirational place among our beautiful outdoor spaces,” McRobbie said. McRobbie ended the ceremony with a comment about the bicentennial year. “Indiana University’s bicentennial affords us the unique opportunity to define the future of IU, rather than surrendering it, by grounding it in IU’s historic strengths, collective past, and dynamic present,” McRobbie said.